Did you cringe just a bit when you saw the word disclosure in the title? Did you assume this post is all about regulations and company policies that may limit your use of social media for promotions, marketing programs and corporate communications? Well, relax. This post is about optimizing your social media activities for improved engagement and increased ROI by building your reputation and trustworthiness in the eyes of those in your social networks. By making the same transparent disclosures that can keep you on the good side of the FTC, FDA, FINRA, SEC and rest of the alphabet soup of agencies whose guidelines you can no longer ignore. The Deniers – These companies haven’t seen the news about brands being called out for lack of compliance. (How could they have missed the recent ban of Nike tweets in the UK?) They may be thinking the current regulations are vague, so any sort of disclosure will do. Or they may be assuming that their agencies are taking care of it for them. (Which sometimes comes as a surprise to the agencies.) Brands in this camp have throttled up their social media programs without taking into account the risk to reputation and cost of non-disclosure. The Worriers – These companies conclude that the evolving regulatory landscape makes it too costly or too risky to engage in social media activities that require disclosure. Social media is off limits for incentive programs, paid endorsements, contests and even certain employee social media messages. Brands in this camp may be watching from the sidelines while their competitors are taking advantage of the full constellation of social media marketing opportunities. The Compliers – These companies are aware that implementing compliant social media disclosures can actually contribute to their creative and effective social media programs and communications. They demonstrate their industry leadership in social media disclosure by using industry best practices, such as those articulated in the July 2012 revision of The WOMMA Guide to Disclosure in Social Media Marketing. Brands in this camp have probably put their marketing and legal teams in the same room to jointly develop social media policies that successfully addressing sales and marketing goals, mitigation risk and fulfillment of regulatory obligations. When a brand seeks to join the conversation of socially connected advocates using an incentive program, paid promotion or endorsement, that brand is relying on the advocates’ reputation to benefit its own reputation. The advocate’s perspective is that he or she is putting hard-earned reputation on the line. Each is relying on the other. So what might happen when the target audience discovers that the advocate has been less than forthcoming in a Tweet, Pin, status update or post? When it’s revealed, after the fact, that the positive review, purchase recommendation or suggestion to enter a contest was motivated by compensation from a brand? What harm could that cause the reputation of the brand, advocate or both? From a regulatory perspective, it’s the responsibility of brands to make certain that their advocates include appropriate disclosures. If an advocate blows it and fails to make a compliant disclosure, it’s the brand associated with the message that will get called out. And best practices indicate that advocates should be able to rely on brands to offer guidance for structured disclosure in their programs so they don’t need to come up with their own. But if there is even the perception that a relationship is hidden, it’s both the brands and the advocates whose reputations are put to trial in the most important court in the world of social reputation, the court of public opinion. The connection between timely and transparent social media communications and long-term, trust-based relationships on social media has been demonstrated time and again. Even when brands make mistakes, rapid and honest disclosure on social media has shown to be more than a means of making amends; it can actually build stronger bonds with customers. Limited character counts and formatting can make it tough to send message along with a clear disclosure in a Tweet, Pinterest Pin, Facebook update or other social post. The difficulty is compounded because, as a matter of trust and compliance, using ad hoc solutions, such as generic link shorteners or including hashtags present a vague disclosure at best. At worst, they provide inadequate disclosures and no context. CMP.LY offers a unique solution for brands and advocates to communicate respectfully in their social networks, make it known they have nothing to hide and provide full disclosures that are just a click away. And we do it in a way in which brands, advocates and consumers all benefit from additional clarity and consistency. Our new plain language URLs — rul.es, ter.ms and leg.al — use 13 or fewer precious characters and present an instantly recognizable meaning about the nature of the disclosure on the click to follow. The plain language URLs can link to a page of content designated by the brand that will be framed with a preview of your disclosure so there are no interruptions in the engagement process. Alternatively, brands can choose to have the link go directly to a dedicated disclosure page. 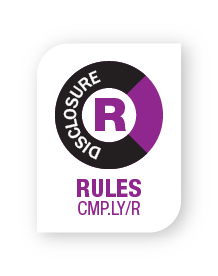 Rul.es, ter.ms and leg.al are one aspect of the CMP.LY Iconic Compliance Framework that includes CMP.LY URLs, along with our recognizable visual badges for multiple disclosure types across all digital and social media platforms. Brands and compensated advocates have nothing to lose and everything to gain by disclosing their relationship. (As well as for disclosing that they don’t have a relationship if that’s the case, too!) Open and transparent communication is the backbone of social media. It’s not only expected, it’s demanded! There is nothing inherently wrong with an advocate having a compensated relationship with a brand. What’s wrong is failing to disclose it. There a good reasons so many brands are poorly executing social media disclosure — lack of clear guidance from regulators on best compliance practices may top the list. The time has come, though, for brands to pivot from what they perceive can’t be done because of regulations to how a structured disclosure program can enhance their long-term customer relationships by strengthening their foundations of trust. Tom Chernaik is CEO of CMP.LY. The company’s unique disclosure solution is built on a foundation of Tom’s experience and insights in marketing, law, social media and entrepreneurship. Tom is Co-Chair of the Members Ethics Advisory Panel of the Word of Mouth Marketing Association (WOMMA) and is a frequent speaker at events on social media ethics and disclosure.